Do you want to get involved? We are looking for Reporters, Columnists and Archivists. Some projects will require in-depth research on a specific issue, others may involve collecting statistics and posting published materials, journals and research. Lastly, we want to sponsor studies that will prove the value of fathers remaining in the lives of their children, post divorce. DO YOU HAVE: News, stories, editorials, cartoons, artwork, pictures, audio, video? WE WANT TO HEAR FROM YOU! Do you want to contribute to our Blog or Podcasts? We are interested in receiving your stories, audio clips, questions about Divorced Dads and their Paternal family such as aunts, uncles, cousins and grandparents. Are you interested in writing or creating audio versions of children's stories? DO YOU HAVE QUESTIONS FOR OUR PODCAST? Watch for the answers in upcoming episodes. Welcome to our archived weekly 60 minute Podcast "Audio Newsletter" called DADcast featuring News, Interviews and audio clips from our Support meetings. You can participate in our Podcasts too, by sending us your questions by email, which we'll answer in an upcoming episode. We'll be covering a wide range of topics of interest to separated or divorced fathers and their new partners and extended family. To learn more about Podcasts please read Podcast FAQs below. Lastly, we want to hear from you, please let us know what you think about DADcast! Podcast FAQs What's a Podcast? It's an audio file in an MP3 format. Where can I listen to this Podcast called DADcast? You can listen to a Podcast (MP3) file on an Apple iPod, other MP3 players, on your computer and on some of the newer cell phones and PDAs (Personal Digital Assistant, such as a Blackberry if you have th right software installed). You can also listen to it on your computer by clicking the play button arrow on the left (below). The audio will stream to your computer. Can I listen to DADcast and browse Divorced-Dad-Daily.com at the same time? If you want to browse Divorced-Dad-Daily.com and listen to DADcast at the same time, click play and the audio will begin. Then open a new browser window and you can read the latest news on the site. "Divorce 101: Learning & Applying The Steps"
5. Divorce 101 – Applying the Divorce 101 steps to your case; Coaching, Mentoring and Masterminding your way to positive, child focused solutions. 9. You can participate in DadCast by sending us questions, audio, news, documents et cetera - Click here to send your submissions or ask your questions. Please let us know what you think about DADcast! Sign up for FREE help from successful divorced dads for Family Court. Stop losing, paying huge legal bills and START WINNING NOW! Fathers Resources International (FRI) Executive Director Danny Guspie and National Shared Parenting Association President, Heidi Nabert discuss fathers rights, family court activism; Mentoring by successful divorced dads for newbies to Family Court. "Representing yourself at Family Court – Watching the Action"
2. “ The Divorced Dad RoadMap continues…Learn how to argue in Family Court and win every time: A great book by Wyoming Lawyer Jerry Spence. 9. Editorial – Scott Paton – The Dean of Blogonomics and Podology – Our mentor from the Internet Marketing Center (IMC) and a TRUE “Podcasting and RSS Genius” – We’re working with Scott on something “Top Secret”…. 10. You can participate in DadCast by sending us questions, audio, news, documents et cetera - Click here to send your submissions or ask your questions. "You are your child’s best advocate"
"Parental and Institutional Child Abuse Defined"
"Waging Peace as your Core Strategy"
10. You can participate in DadCast by sending us questions, audio, news, documents Click here to send your submissions or ask your questions. 1. “ The Divorced Dad RoadMap" continues…Who really has custody of your kids?”. 2. What distinguishes Fathers who win versus fathers who lose at Family Court? "Fathers Rights is not a Dirty Word"
1. Fathers Rights is not a dirty word, if Winning = Peace for your Child. Introduction to the “Divorced Dad RoadMap”. 8. You can participate in DadCast by sending us questions, audio, news, documents et cetera - Click here to send your submissions or ask your questions. "White Knight Syndrome: Why some Good Men Lose in Family Court"
5. Representing yourself in Family Court - Is it common? Wise? Possible? 8. Editorial –[Content].99 for the Dnny's on ITunes; Springtime: The end of Shovelling Snow and Scott Paton – The Dean of Blogonomics and Podology – Our mentor from the Internet Marketing Center (IMC) and a TRUE “Podcasting and RSS Genius” : he’s the inspiration for this podcast. 5. Women Gatekeepers at Family Court and elsewhere: Do they all hate men? "YOUR GAME PLAN to save a lot in legal fees"
"How to Find A good Lawyer"
7. You can participate in DadCast by sending us questions, audio, news, documents et cetera - Click here to send your submissions or ask your questions. We call it - DADcast. Welcome to our first 60 minute Podcast "Audio Newsletter" called DADcast featuring News, Interviews and audio clips from our Support meetings. You can participate in our Podcasts too, by sending us your questions by email, which we'll answer in an upcoming episode. We'll be covering a wide range of topics of interest to separated or divorced fathers and their new partners and extended family. "The ULTIMATE Best Interest of the Child"
Go to DIVORCED-DAD-DAILY.COM - Sign up for FREE help from successful divorced dads for Family Court. Stop losing, paying huge legal bills and START WINNING NOW! 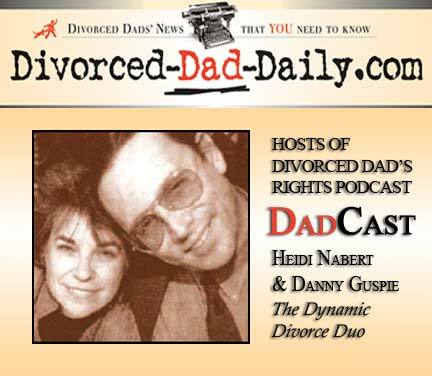 Fathers Resources International (FRI) Executive Director Danny Guspie and National Shared Parenting Association President, Heidi Nabert discuss fathers rights, family court activism; Mentoring by successful divorce dads for newbies to Family Court.